1).The start/stop/start/carry on nature of the Florida Swing resumes in the Tampa area this week, at Innisbrook Resort's highly regarded Par-71 (5 x Par-3's, 4 x Par-5's) Copperhead Course. Bay Hill next week, then off to Texas for two weeks at Austin's WGC-MatchPlay and the Houston Open, which still awaits a sponsor. 2).Phil Mickelson won't be in town, but congrats to him for overcoming Justin Thomas in last week's exciting WGC-Mexico. This puts Phil in the driving seat to qualify for yet another Ryder Cup, and fellow lefty Brian Harman has also climbed into the qualifying spots. Top 8: Thomas, DJ, Koepka, Phil, Spieth, Kuchar, Harman, Woodland - next four outside automatic placings: Fowler, Bubba, Reavie, Kizzire. Golfers from Hazeltine currently outside the Top 12 are: Reed (13th), Zach (20th), Holmes (27th), Moore (30th), Snedeker (35th), Walker (40th). 3).Phil becomes the 4th Pro to reach 3 x WGC titles after Woods (18 - and counting? ), DJ (5), Ogilvy (3). And a reminder that Darren Clarke, Day, Els, Mahan, Matsuyama, Poults, Rory, Rosey and Adam Scott all have a couple each. 4).Plenty of fine performances in Mexico, not least by Tyrrell Hatton but, let's face it, Hatton looked a complete Wally at times when he was struggling to make birdies early in his round. Then he enjoyed a purple patch including that quite magnificent shot to within a few feet for eagle. Once he'd joined the leaders he was going to go on and clinch the title, wasn't he? From the middle of the 18th fairway, some kind of wedge in hand, he contrived to lose three shots to Thomas's eagle, rounding it off with a 10-foot putt for a chance at the biggest championship of his career which he left woefully short. What was he thinking? Was he thinking? Not what we want to see from a potential Major winner (but not like that) and Ryder Cupper. 5).As at "Honda", the Valspar field is short of many leading Americans, with only Spieth and Kuchar of the owgr Top 24 avoiding the temptation of a week off. And, as at "Honda", the leading Europeans are playing to beef (no, not him) up the field, Rose, Garcia, Rory, Stenson and Casey all teeing it up. 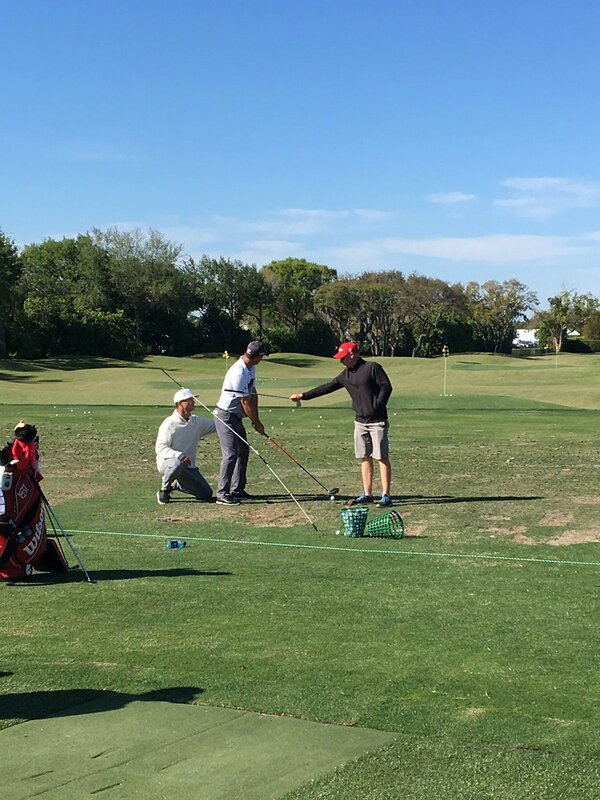 6).Bill Haas is here too, thankfully following his LA Ferrari ride and injuries, physical and mental no doubt. Good luck to him. 7).And so is Tiger Woods, making his first appearance at Innisbrook since the mixed team event 22 years ago (with Kelli Kuenhe - both dressed in red that Sunday!). Tiger played really well at the Honda Classic and he should have a comfortable pairing again this week with Spieth and Stenson. 8).There are plenty of course specialists in the field including Kuchar, Justin Rose (arguably should have won here a year or three ago), Spieth, Sergio, Stenson and Jason Dufner who's finished in the Top 28 the past nine years. But my one-and-done this week is Cameron Smith - he needs just one decent week to qualify for Augusta (his team win in New Orleans doesn't attract the Hooties' attention unfortunately), and has been in good form without really contending. But fairways (40th in total driving) and greens (57th in gir) are the order of the week and he's overdue for his first solo US win. That’s a bit harsh. I’m assuming there’s been a statement on his wife’s pregnancy from an agent or a journo. And the only confusion is that there’s been no confirmation either way. If he doesn’t play that makes perfect sense, but equally understandable if he decides to since it’s just down the road. Can only assume he’s not decided himself yet. Because I read this article and I think "Not pulling out" is why he is a father in the first place. If the Match Play was played anywhere other than his hometown, I can see skipping the event. But seeing that he lives in Austin, and the tournament is being played across town, he can be home every evening. Austin, despite it being the best city in Texas is a pretty weird (pun intended) place to live for a professional golfer. You can play golf nearly year around in Austin TX (there might be 10-14 days where it is too cold). There is generally not many rainy days and the humidity is lower than Florida. It doesn't hurt that Austin is where all of his wife's family lives. Incidentally her cousin is one of the best Quarterbacks in the NFL, Drew Brees for the New Orleans Saints. And another incidentally, my nephew lives in Austin, and he and fiancee love it. Watch out for a pretty compelling read in April's Golf Digest, something like a ten-page article with a dozen or more anonymous "insiders' opinions about Tiger Woods's prospects for The Masters. Plenty of stuff I'd never've thought of, very interesting. Can't link it yet. And one trivia gem I'd not thought of: Only one golfer has won a Major before, during and after the "Tiger Era": Ernie Els. Are you sure we are “after the Tiger Era”? GPB wrote: You can play golf nearly year around in Austin TX (there might be 10-14 days where it is too cold). There is generally not many rainy days and the humidity is lower than Florida. It was more the geographical issue I was thinking about. pedro wrote: Are you sure we are “after the Tiger Era”? I guess so if he has moved to captaining instead of playing the pres cup? It may just end up being as a playing captain, just as he didn’t rule out being playing VC at the RC. Apparently he’s now also the API betting favourite, so he’s hardly history. That photo can only be Padraig. Think the Tiger era was 2000-08 inclusive. Before then he was exciting but not the only thing going on in golf, since then he’s still won but hasn’t been the same constant presence. Doesn’t mean he can’t or won’t win again. Wouldn’t say 1986 was in the “Nicklaus era” but it didn’t stop him winning the Masters. The main purpose of betting odds is to mitigate losses for the bookmaker. In light of the NMR sycophancy lately, it's only natural his odds are deliberately low, lower than his general chances. Garcia is apparently 50/1 for the Masters, despite being the current champion and in pretty good long term consistent form. NMR has had 2 half decent tournaments in 3 years and is in to something like 15/1. As the Yanks would say "go figure". As for his chances in the Ryder Cup, if he doesn't make the team through points, only someone with a commercial bent would pick him. His points record is poor, and he shows time and again how he isn't a good team mate. NMR has won I don't know how many times at Bay Hill, but I agree that 15/1 is a stretch. I'm sure the bookies will make good money out of it. If NMR approaches anyway near top 15 in the RC qualification list he will be hard to look past. So let's hope he does well over the summer as TW in the US team should be an advantage for Europe. If it wasn't for his upcoming fatherhood and what that could bring in terms of lack of focus, Garcia at 50/1 would be a steal. I'll probably put a 10'er e/w on him. NedB-H wrote: That photo can only be Padraig. Is that an arm up his behind? Strange practise drill, but it certaintly explains his silly pinguin walk. I'm sure they will. NMR might well have won many times at Bay Hill, but that was ever such a long time ago. I admit I would be less surprised if he won now than if you'd asked me 3 months ago, but I really think he's up against talent far greater than anything he's faced in the last 10 years. Would love to see what would happen if NMR came up against Rizla, Rahmbo, Rev Gordon or Thomas. Not sure how many of them are playing at the API but I think he's yet to come up against a full field of truly top notch players. The player formerly known as 9C is grouped with Day and Hideki. So with one player he can exchange medical stories and with other he can talk to a wall. Should be a nice backdrop to the baying mob. Rose, Stenson, Fowler and Fleetwood Mac are also in the field. So decent showing. Hideki actually makes TPFKANC look like he has a personality. I heard he did his press conference from the maternity ward at the hospital. Labour can be a long slow process with lots of hanging around for the father, so every opportunity to speak to the media. But Mrs Garcia must be a very understanding lady, there can't be many women who would allow that! Super has missed an open goal here. Hadn't spotted that Els & Furyk have special exemptions into June's US Open. That's quite normal for the States Ray, remember this is a country where a newsreader thought Ho Le Fuk, Wei Tu Lo, Sum Ting Wong and Bang Ding Ow were genuine names for hijackers following a plane crash. Labour can be a long slow process with lots of hanging around for the father, so every opportunity to speak to the media.